Luckily, apart from shaken nerves, she was unscathed. But, I spent the next several hours fighting with tears of relief and feeling like a horrible, irresponsible puppy mom for not keeping her far away from that edge. My days feel both frustratingly unproductive, with the puppy distracting me from my work every other minute (though, even when I am working, I find myself mostly staring at my pages of data and feeling unable to start) and pleasantly full with the little moments of annoyance, amusement, and joy that come with learning to take care of another life. But, I feel as if I don’t have that much to say because I haven’t been feeling confident that these are stories worth telling. And, if you aren’t convinced your story is worth telling, it can unfortunately be a self fulfilling prophecy, delivered like a joke whose punchline comes out wrong, leaving everyone with quizzical looks rather than guffaws of laughter. In the stillness of today though, my mind is shushed and resting in a corner, curled up like a puppy. It’s worn out from spending so much time bustling about in my head blustering about what I should be doing, and saying, and accomplishing, and getting on my case for letting me get on my own case. With my little bit of internal quiet echoing the external quiet, I’m encouraged that these little snippets of stories are worth something, that the everyday is the story as much as the absurdities and oddities are at other times. This is where I am right now. And, I’m drinking a dirty chai latte that I made for myself. That doesn’t hurt either. It’s no bedtime libation, though, as the bold, but not aggressively so, caramel bitterness of espresso asserts itself through the blanket of dairy. The flavors scuffle briefly, then resolve into a beautifully harmonious, complex, and aromatic drink. It’s like the beverage version of a rejuvenating back rub and aromatherapy…or something. The recipe is basically my own rendition of my adorable friend Jenny’s dirty chai hot toddy, sans bourbon. Though perhaps if I did juice it up with a shot of bourbon I’d feel even more inclined to relax and savor the moment. It’s delicious and invigorating enough without it, though, and it’s definitely not 5 o’clock yet in my somewhere. And it couldn’t be easier. 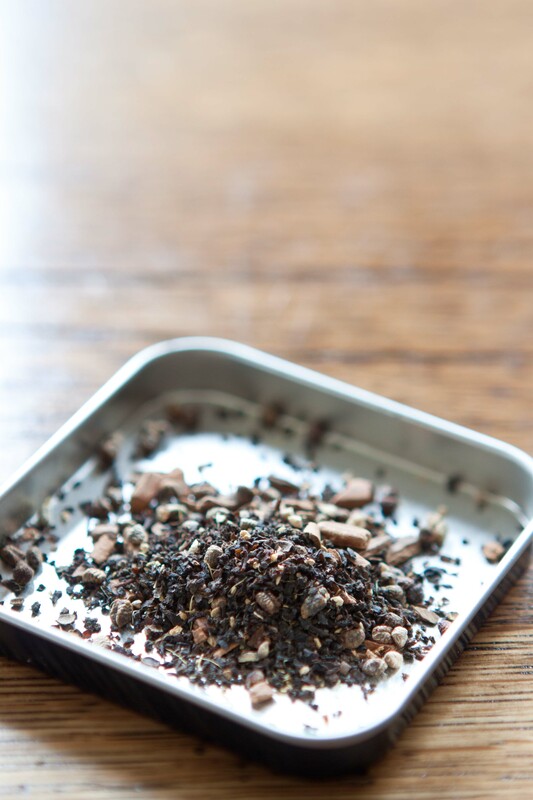 Just steep a blend of spices (you could also use your favorite loose leaf chai tea) in whole milk until it is thoroughly infused. Strain the warm milk, and spoon in a drizzle of golden honey for sweetness. If you’d like to whisk and froth it up a bit, by all means do so. Divide this into mugs, then upend a long shot of espresso into each. 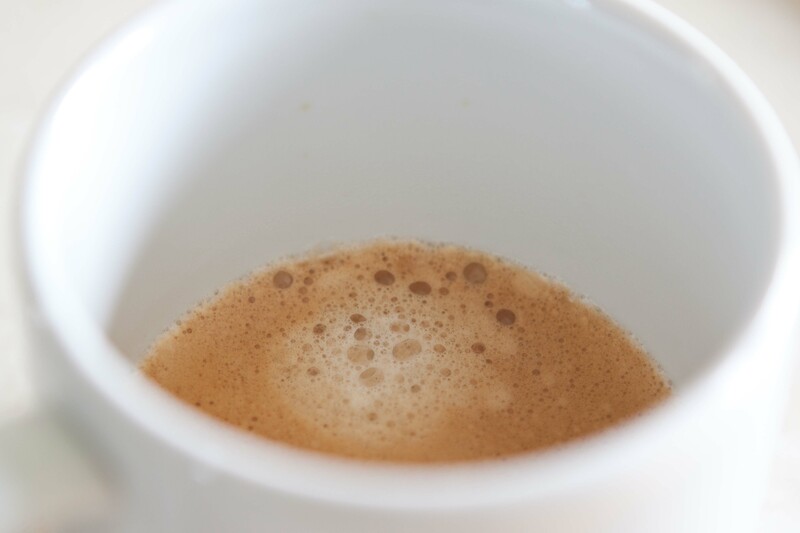 Or, to be a bit fancier, pull the espresso into the mugs, then carefully pour the flavored milk into each mug, raising the foamy chestnut colored crema of the espresso to the surface, like a barista would. Whatever your skill level with this, it will taste marvelous. Sit, sip, and enjoy a bit of stillness, however brief it is. Add the black tea and allow to steep 5 more minutes. Strain the milk. 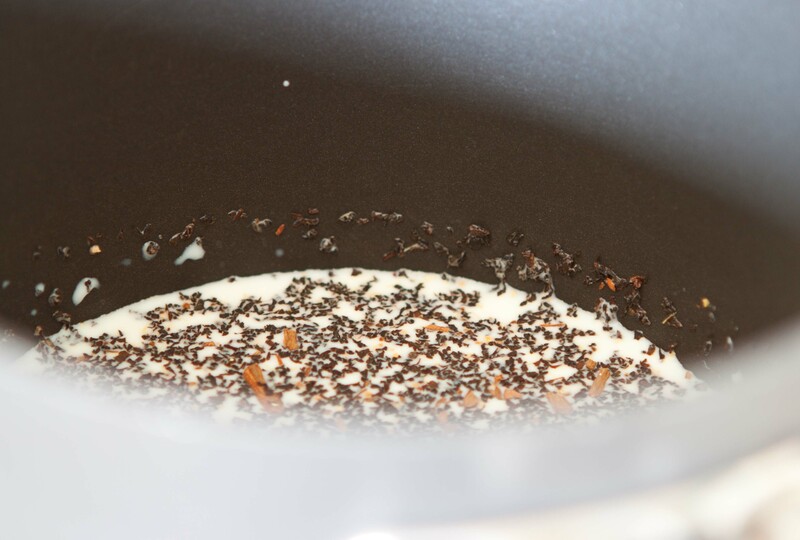 Return it to the saucepan (get any remaining spices out of the saucepan) and gently rewarm the milk if needed. Stir in the honey. 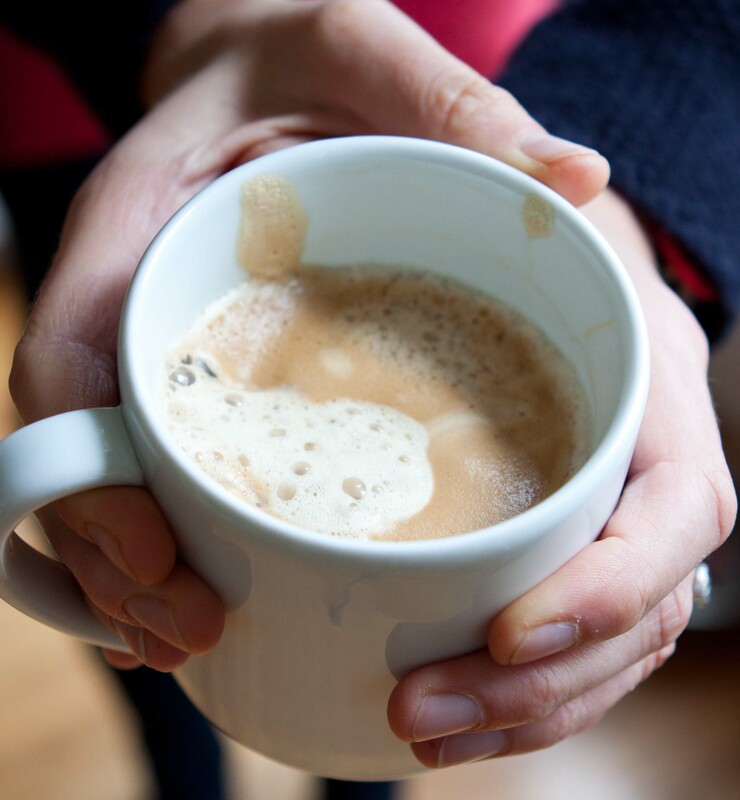 Split the spiced milk between two mugs and add a shot of espresso to each. Enjoy! Thank you! It is perfectly wonderful for a cold day, especially one that is either drizzly, grey, or snowy! I love this. I’m not a huge fan of tea but I really like the idea of mixing it with espresso (I’m a coffee girl at heart). Sounds like the perfect hot drink for a Sunday afternoon. I’m totally a coffee girl at heart too. But, I really love this drink! Definitely good for a Sunday afternoon. Em – love this idea. We’re drinking spiced Turkish coffee, warm eggnog, and gluhwein. I’ll definitely try this hot beverage next! Mmmm. Your lineup already sounds pretty awesome. I need to get my hands on some eggnog here soon! I’m going to go get one of these at Starbucks (cheating, I realize) right now. Maybe it’ll get my slushy brain up from napping in the corner. Sometimes one needs to cheat just a little to get one’s slushy brain up and running again! This was beautifully written Emily. I enjoy your blog so much. Love reading about your puppy antics! it brings back memories of our puppy days. And I’m happy you could enjoy a quiet moment with this wonderful latte. The addition of espresso sounds marvelous! Thanks Hannah! Puppy days are a special, very energetic and wiggly, sort of time! Reblogged this on Pretty Sparrows. 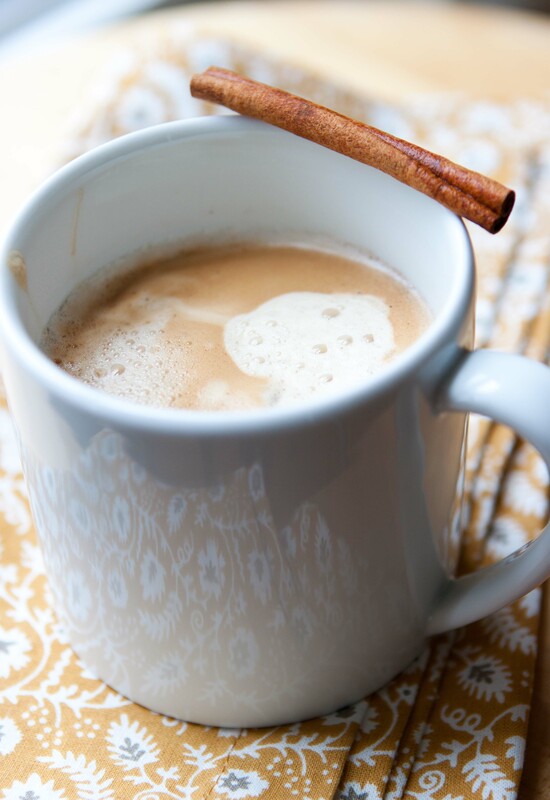 You are currently reading Dirty chai latte at Five And Spice.